Holi is the festival of colour without color in the life, life is nothing. 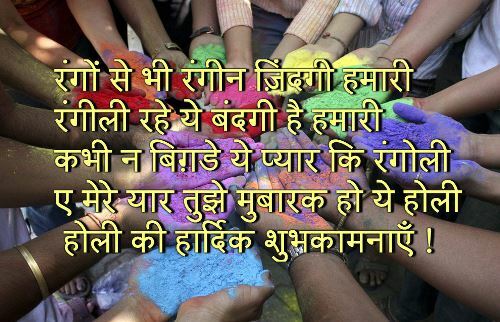 I wish you a Happy Holi 2015 in advance. As you know that Indian people had a lots of fond of enjoying festivals. They enjoy different types of festivals like Navaratri, Holi, Diwali, Idd, Christmas, Uttarayan etc. Among them Holi is a special festival of colours. There is a legend for this Holi festival. It is as under. There is a king named ‘Hiranyakashyap’. He had a boon that no one can kill him. So he became very cruel and told everyone that he is a god for them. So they had never pray for god but pray for him. Everyone accepted his talk as he was very cruel. If anyone not accepts his talk he killed him. But his son whose name was ‘Prahlad’ opposed him, and said there is only one god and it’s ‘Narayan’. So he requested all the peoples to pray for narayan, not for his father. He also told his father to leave away stupid thought and pray for Narayan. So his father got angry and tries his best for killed ‘Prahlad’. But every time god saved him. So at this time he thought finally killed ‘Prahlad’. So he called his sister ‘Holika’ who had a boon that fire can’t touch her. He told his soldier to collect lots of wood and orders Holika to sit on wood with Prahlad on his lap. Holika had a magical Chundadi so fire can not touch her. Hiranyakashyap ordered soldiers to give fire to the wood. Soldiers give fire as soon as the high wind blow and her magical chundadi gone away and she burned and god saved Prahlad. As on the day of Holi Hiranyakashyap going to killed Prahlad so people keep fast on that day. This festival is celebrated on Purnima of Falgun month every year. The Second day of Holi is known as ‘Dhuleti’. It is a day of colours and people enjoy that day very much. They color each other. Every body enjoy with colour and water. People enjoy that day for saving Prahlad. In Holi festival people make worship of Holi and pray to keep them healthy. People worship them with popcorn. Happy Holi 2015 will be celebrated on 5 March 2015 in india. People send Happy Holi Wishes through Holi SMS, Holi Massage, Holi Images, Holi Photo, Holi Whatsapp Status, Holi Song etc. So today we have put a lovely collection of Happy Holi on this page. We hope you like Happy Holi Wishes Post Very much. If you like Happy Holi SMS then please share with your friends and family.